Congratulations to tour winner Jean C. and to host winner T's Stuff. 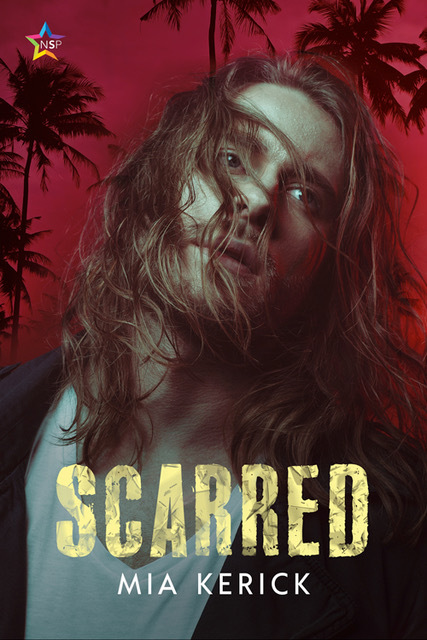 Goddess Fish Promotions is organizing a Virtual Excerpt Tour for Scarred by Mia Kerick,a LGBTQ Contemporary Romance available December 31, 2018 from NineStar Press. The tour will run December 31, 2018 to January 11, 2019, and this tour will not include interviews or guest blogs; however, a blurb, exclusive excerpt and author bio will be provided to every host for inclusion on their blog. Additionally,a PDF, Mobi and ePub copy of this story is available for review in conjunction with a promo post. Mia Kerick will be awarding a $10 Amazon or B/N GC to a randomly drawn winner via rafflecopter during the tour, and a $10 Amazon or B/N GC to a randomly drawn host. Placida Island’s gentle ocean breezes and rolling surf beckon to those who wish to reside in remote tropical serenity. TWO men living in self-imposed exile. Wearing twisted ropes of mutilated skin on his back and carrying devastating damage in his soul from severe childhood abuse, Matthew North lives alone in a rustic cabin on the shore, avoiding human contact. Gender fluidity his perceived “crime” against family and friends, Vedie Wilson flees his childhood home so he can freely express his identity. THREE persecutors seeking their warped view of justice. Vedie’s past refuses to stay in the faraway city he left behind when family members, intent on forcing him to change, steal him from his island home. TOO MANY scars to count. Their beautiful faces masking deeply scarred souls, Matt and Vedie live in hiding from the world and each other. Can they unite and embrace each other’s painful pasts, leaving the scars behind to find love?